This book is full of thought-provoking and chilling ideas and it paints a terrifying vision of the future. It features realistic and relatable characters, struggling to do the right thing in a world where free thought is oppressed. I would definitely recommend this classic to anyone who is comfortable reading fairly advanced stories, and anyone interested in science fiction and dystopias. It is a classic and everyone should read it at least once. Nineteen Eighty-Four takes place in a superstate called Oceania, which includes the Americas and the British Empire. The world has been divided into three massive superstates after a world war. And finally the working class Proles, who make up most of the population. The main character, Winston Smith, lives in Airstrip One, a country once known as England. He lives in the ‘chief city’ of Airstrip One, which is covered with posters and propaganda: mainly of Big Brother, the party leader. Below the picture of his face is the words ‘Big Brother is watching you’. 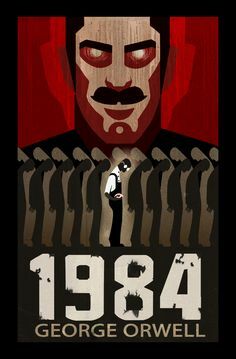 All citizens also have their whole lives monitored by telescreens, which let the Thought Police locate and stop anyone against Big Brother and the Inner Party. Families are caused to be divided, as children are told to tell the Thought Police about any criminals, even including their own parents. He works as an editor in the Ministry of Truth, which rewrites and twists information and history to make it follow anything the Inner Party desires. When someone disobeys the Inner party and are killed secretly, he rewrites the articles and books that mention them, too make it seem as if they never existed. He then incinerates the original texts. However, he soon becomes amazed by the truth of the past and tries to save as much of it as he can. He also hides where he thinks he cannot be seen to write a journal against the Inner Party and Big Brother, something he would be killed for by the Thought Police if they found out. Winston Smith lives in a dystopian, oppressive society lead by the Inner Party. Every citizen has their life monitored by telescreens. Everywhere he looks, he sees posters bearing the face of the Party leader called Big Brother, with the caption ‘Big Brother is watching you’. Winston works for the Inner Party by twisting and rewriting history. However, after realising that the truth is worth fighting for, he rebels with his lover Julia by going against what Big Brother believes. They have secret meetings where they believe they cannot be seen, and find a way to take down the evil of Big Brother. However, the two ‘thoughtcriminals’ are captured. Winston is tortured and betrays Julia when he is about to be killed, thus losing to Big Brother. Winston is put back into the society. At the end of the book, he looks up at an Inner Party poster and realises that he loves Big Brother. Sources: Image from lightlit, written by George Orwell and published by Harvill Secker.